I have been contacted a few times during the past two years by people hoping to find out which of the approximately 3000 vintage Penguins were issued with green covers. There are many collectors who are only interested in green-spined Penguins, and so they tend to be the hardest to locate and most the expensive to purchase. Perhaps such a list already exists, but I've never been able to find it, and so it seemed that the best approach would be to try to create one over time, starting with the green Penguins I already owned, identifying likely candidates by the authors and titles, and adding to the list with each new purchase. Admittedly, it was an approach which was going to take a long time to achieve its objective. Just recently, though, I have been given some wonderful and much appreciated assistance by fellow Penguin collector, Jonathan Light. Over the past few weeks he has traced hundreds of missing titles and identified a few others that had been wrongly included. Our joint list, which can be accessed here, remains provisional, however, and there are likely to be some titles we have missed, particularly amongst the higher numbers. Our hope is to end up with a complete and accurate list, so we would love to hear from anyone aware of pre-ISBN green vintage Penguins we have neglected to include. Jonathan's research has identified some interesting anomalies such as #1857 Famous Trials VII (which concerns Oscar Wilde's trial), which has an orange spine despite all the other books in the series, before and after, being green, and #2978 Doll by Ed McBain which is included in our list even though it has an orange spine, as it bears a Mystery and Crime series heading on its cover. 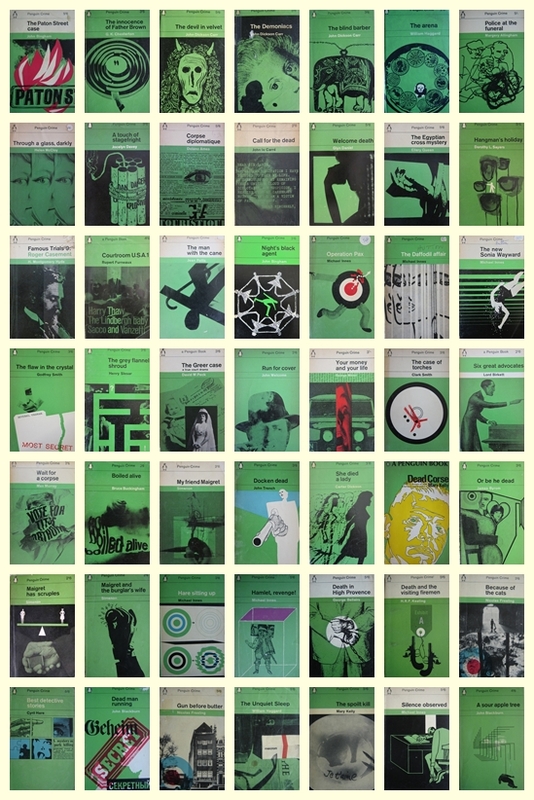 The provisional, but almost-complete, green vintage Penguin list. Karyn, that's a wonderful idea and a wonderful thing to do! I confess I always lean towards green Penguins and some of them are so hard to come by! This will be a great resource - I will check against my small collection later! Thanks Karen, that would be great. This is fascinating, Karyn. Just out of curiosity - can you (and anybody else is welcome to join) name some particularly rare green Penguins? I understand that the green editions from the first ten are worth at least twice as much as the others, provided they are first editions. Almost all the ridiculous prices, though, are for a few green Penguins numbered around 400. Panic Party (#402) is the one most often mentioned because I understand there is a copy for sale in the shop across from Addyman Books in Hay-on-Wye priced at 500 pounds, or at least there was in February. And I've mentioned before Artifex Intervenes (#410) which I was surprised to find out is uncommon because I have it. I see, the wartime ones. I found an old eBay listing for 'Panic Party' at 775 pounds, no takers. Hi Karyn, I love trying to solve anomalies in lists, so I checked my own collection of Penguin greens against your list and found 2 that you might have missed - 1509 and 1703. Also, I found another Ed McBain oddity - 2393 The Heckler has a black spine, although the Penguin logo on the cover is in green. Hope this helps, Ian. Thank you so much for checking Ian. I'll add them to the list tonight. I have a complete list of all Penguin books published up to number 2088 with all of the colours listed of the covers and then the higher numbers are more sporadic. If this helps I am happy to send it to you. I got it from a gentleman in England several years ago. Thanks Pam, that would be great. which seems not to have been maintained in a good while. The separate listing of greens and the various sort orders are a boon, though I've found it not completely accurate. I recall seeing that collection a long time ago, but I had obviously forgotten that they had been partially partitioned by colour. Thanks for the link. could be a bonanza for someone (hardly in Aus, where surface delivery by Parcelforce would be nearly GBP 100), though I imagine the bidding is likely to go quite high in the next four days. Very interesting, Flavia. All green, and seemingly all first editions, with some of the rarer ones included, so I expect the bidding is likely to go very high. Hi again Karyn, I've had a rummage about on my shelves and came across green Penguin no 1953 C.P. Snow "Death Under Sail" which I can't see on the list. I have a shelf of Ed McBains (although not many in Penguin) and I will check these out later. Wonderful Karen - I've added it to the list. A green Penguin came into the library donation box a few weeks ago (which rarely happens), but I didn't buy it because it was a crime novel. Now I am kicking myself!